Chocolate body parts. Dr. Scabs has been busy in his monster lab making an assortment of chocolate body parts. You get peanut butter lips, fudge filled eyeballs, double crisp fingers, ears and toes. Some consider somewhat gross, but what better then gross Halloween candy to have at your Halloween party or to hand out to all those little witches, ghosts or to Frankenstein that will come knocking at your door. 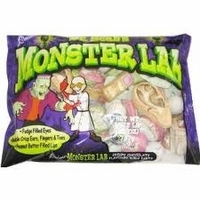 Chocolate body parts are individually wrapped and come in a 22 oz bag for frightful fun.